This is, of course, a metaphorical conception of Bayco’s audience; the modern idea of royalty has grown to include everyone who hungers luxury and who understands the intricate labor and savoir-faire that goes into every Bayco piece. The sophistication once enjoyed only by half a dozen people in each country has spread to a more generalized—but still rarefied—luxury-loving elite. Though Bayco is a relatively new name in the world of precious gems, the expertise and passion it brings to the field is generations old. The family saga began with Amir Hadjibay, a young man with an entrepreneurial bent. Traveling between Iran and India, he began to develop an interest in precious gemstones, trading them for elaborately woven Persian rugs. Soon he began to visit India’s regal maharajahs, leaving with bits and pieces of their legendary jewelry collections—show-stopping diamonds, carved emeralds and fiery rubies, among other gems. It was a simple step to create their own designs, populating them with the cherished gems they knew so well. There would be no mass production; the Hadjibay brothers decided from the beginning that they would create only one-of-a-kind pieces, the better to devote their resources to the greater glory of the exquisite stones they wanted to showcase. The family bonds persist into the next generation; Moris’s son Marco recently joined the company, bringing a youthful enthusiasm, vigor, and commitment to the future. 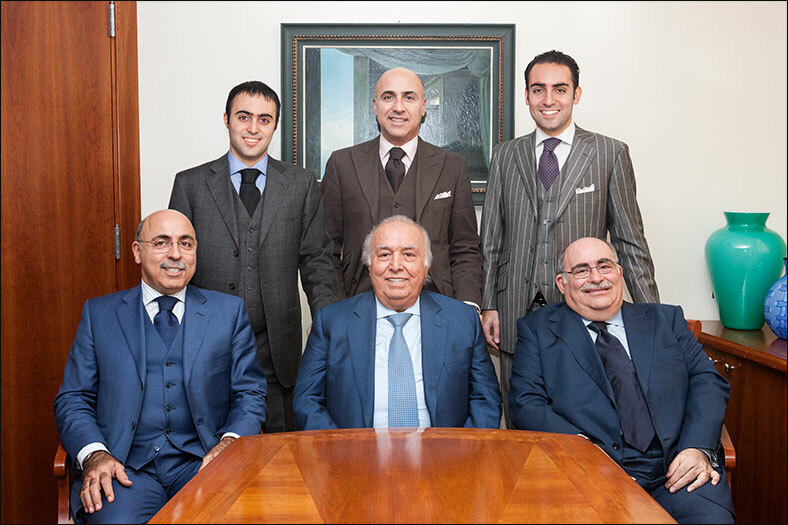 The Hadjibay brothers design as a team—having grown up together around the world of gems, they share a design vision and impeccable taste. Though neither has had any formal training in jewelry design, finely honed instinct and decades of experience guide their steady hands to create pinnacles of jewelry. These creations are among the most exceptional in the world— ravishing rubies that emanate aesthetic richness, dazzling emeralds that beguile the mind, celestial sapphires that capture the sublime and enrapturing diamonds that transcend all epochs and eras. The family expertise in gems has led to astonishing opportunities rediscovered. Moris remembers asking his father about his greatest regret. Amir told his son about “the one that got away”—a stunning 60-carat pear-shaped sapphire of the deepest blue. It came from the Kashmir mines, Amir told Moris, a source of the world’s most exceptionally blue sapphires, which has been closed for decades. The equal of such a gem would be impossible to find again. Years later, Moris came across a sapphire the likes of which he had never seen—a huge, exquisitely perfect gem. He immediately recognized the stone that had eluded his father years before. Proving how near the apple falls to the tree, Moris bought the gem on the spot. The perfect sapphire, Amir confirmed, had indeed made its way back to the Hadjibays. Such a regal stone deserved nothing less than an aristocratic home, and the happy gem now resides in one of the most important royal collections in the world. Bayco jewelry effortlessly mixes old and new trends: its pieces are often influenced by the Mogul era, jewelry of the Indian maharajahs, and classical jewelry, which makes the beauty of each stone stand out. Jewelry is eternal; its beauty never dies, so old designs and ideas live again when paired with a new neck or wrist. The story starts with the stone, but it does not end there. The larger the stone, the more likely its design will include traditional elements. “A woman who buys a large stone wants something classic,” explains Giacomo. A fashion statement, no matter how original or compelling, cannot be worn every day, and it runs the risk of becoming dated. The Hadjibays must recut every gem that passes through their hands in order to ensure that its full beauty shines through. Another aspect of their art enters into the equation when matching stones for an exquisite bracelet or necklace: Giacomo and Moris have access to an encyclopedic mental palette, instantly comparing a new stone to those waiting to shine, ready to pounce on a sapphire of the exact blue needed to complete a design. “Matching color depends on taste and experience,” explains Moris, and the Hadjibay brothers have both in spades. The designs are classic, yet youthful—and the stones within are justly renowned for being the finest in the world. Bayco’s precious testimony of a passion for stones is a delineation of ultimate beauty in all of its forms. It is their devotional ode to every gem.